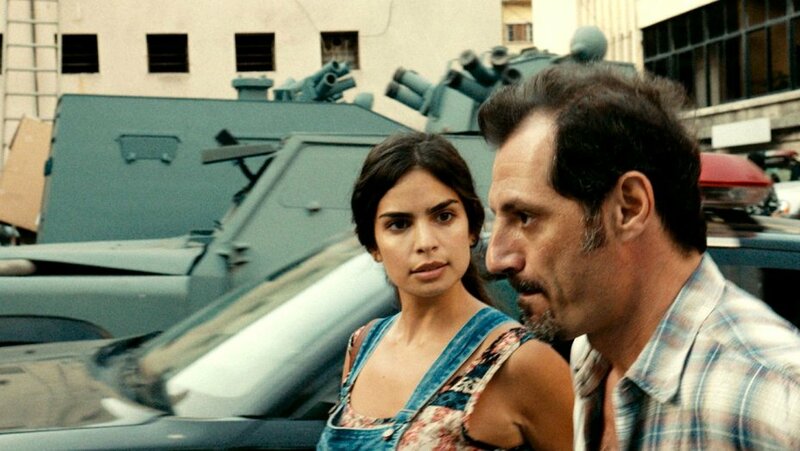 In The Insult, a religious and geopolitical conflict is examined on a microcosmic scale: A Christian of Lebanese descent and a Palestinian Muslim enter into a heated battle of egos that spider-webs into an event whose stakes are far greater than any one participant in an argument. Through careful observation of human and behavioral impulses, screenwriters Ziad Doueiri (who also directed) and Joelle Touma have crafted a cautionary and urgent fable about the biases, both unconscious and learned, that drive all of us and how violence trickles up through the roots of those biases to cultivate and grow. Eventually, the dividing lines are drawn, and no matter how we try, we cannot escape our shared histories. The argument starts simply enough, as most arguments do: Tony (Adel Karam), the Christian, is watering the plants that reside on his outside porch, which exists about a floor above ground level. The water splashes through the broken drain, at times onto the people who might walk underneath his porch. It’s an easy thing to do, too, as that side of his apartment building faces a sidewalk that divides the residences in half. Obviously, it would be up to Tony to have the drain fixed, but stubbornness and, perhaps, more than a bit of pride have factored into the decision not to fix it. If it comes to that, in any case, he’ll do it himself. He won’t have an unknown man in his house alone with his pregnant wife, Shirine (Rita Hayek). The reality of the water splashing from above is exactly what causes Tony to cross paths with Yasser (Kamel El Basha), the Muslim. He is a handyman for such occasions as fixing a broken drain, and when he notices the problem, he offers to fix it. Tony, of course, refuses. Yasser, still wanting to remain cordial but also remind Tony of the local safety codes, fixes the drain anyway. Tony, with his pride in full view of everyone, callously destroys the newly repaired drain as a way of flaunting his disdain for Yasser and everything for which he assumes Yasser stands. Yasser’s response is to use a compound vulgarity (one part of which is a seven-letter adjective that acts as a redundant modifier for the noun of the phrase, which is one of the three stand-ins for male genitalia), for which Tony demands an apology. Yasser, who himself has a bit of the old pride in him, takes a long time to work up to feeling apologetic. It’s understandable, too: He performed a service for Tony, and even if the other party did not consent to the service, it seems unworthy of the destruction of property. When it finally seems ready to occur, Tony returns the vulgarity with a different kind (the invocation of tyrannical violence from a specific source), which turns the situation into a physical one. A legal situation develops, with lawyers (played by Camille Salameh and Diamand Bou Abboud) hired to defend and prosecute, respectively. Revelations, some expected and others enough to bowl over viewers, occur during the litigation of the event. Neither has been totally forthcoming about their shared, relative experiences with Christians and Muslims. Shirine’s pregnancy is put into jeopardy by the stress of the events. The lawyers are connected in an unanticipated way, entering their own battle of wits informed by longstanding insecurities. The legal question becomes two-sided: The argument should not have turned physical, as that is a literal assault, but Tony’s comment regarding the wish for genocide is an assault of a different kind. The answers in The Insult do not come easily, and Doueiri never has delusions of subtlety regarding this material. The nuance in its arguments remains, though, and through expert filmmaking and superb performances, the film fights the good fight. All hottest yesmovies are added quickly as it released and very simple to navigate.